Greetings friends and fellow crafters. LeeAnn here with a project for the Joy Clair July Challenge theme of Anything Goes using your favorite Joy Clair stamp set. I had this project in mind for a while, sat down and made it and just knew it would be used for this post. The base is a Recollections A2 size base with gold foil trim. I then cut a 4.25" x 5.25" panel from Recollections 110 lb white cardstock and sprayed with Fireworks "Summer Sky" from Imagine crafts. to achieve the blue background. Once I had that base dry I used a square die and cut out a section that was offset from the center. I then sprayed it a little more to make it a little darker to resemble water and let it dry. I stamped the frog on Recollections 110 lb white using Memento Cottage Ivy and let it dry. I then cut it out with my Scan n Cut. On the square I had cut I used my Kaleidacolor "fresh greens" ink pad to stamp the lily-pads using the "Ink Splatter" stamp set. I cut a square of mesh larger than the square and used double stick tape to attach it to the inside of the top panel, and to attach the "lily-pad" square to the base. I attached the top panel to the base using foam dots and then added the frog. For the sentiment I used Stazon Hydrangea Blue to stamp it, then cut the rectangle with a die, and used a Fantastix stick to pick up color from the Kaliedacolor pad to ink the edges. And with that my project was complete. I hope you have enjoyed it, and I look forward to seeing all the great projects entered into this months Challenge. 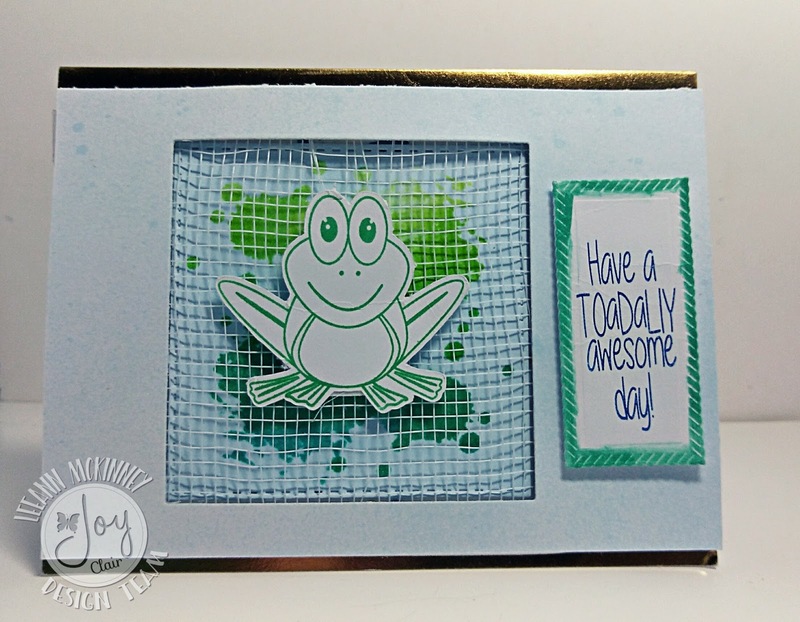 Such a fun card, love that frog! LeeAnn, cute card! Love the image and the layout of your card.